The only one of its kind in the country. A souvenir guaranteed to be kept and displayed. This will be a once-in-a-lifetime gift for your guests... a photoshoot with family and friends in a customized and personalilzed studio setup depicting the destination or theme of your choice... all done and printed during your wedding reception! 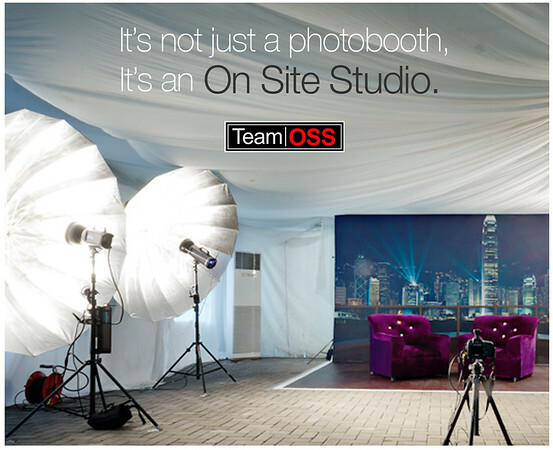 We, at Team On Site Studio (Team OSS), give you the best of both worlds. As they say, a professional photographer is there to capture the moments at your special event, while a photobooth gives a token souvenir for your guests – we are both. We, at Team OSS, are professional and published photographers who are there to capture those moments of you and your guests through professionally controlled studio lighting and set design. Lighting is an important element in photography and in creating beautiful images. It can literally make or break your pictures. It can also add to the emotions of the picture by showing details like expressions and feelings of the subject. In order to make the best use of lighting, we use a minimum of four professional grade studio flashes and modifiers and only the top-of-the-line professional full frame cameras and lenses. To this day, on-site studio portraits, also known as on-location photography, has only been reserved to commissioned works for magazines and other forms of advertising agencies. We, at Team OSS, are breaking that norm. We give you advertising grade images any place, any time. Follow Team OSS on Instagram and Facebook.